To keep everyone informed on the changes that are made at FASoS in response to your feedback, FASoS staff and the Student Reps started a new series. The button in the GG76S bikeshed was in a bad place, leading to a dangerous situation when leaving the bikeshed. The button is now successfully moved, so everyone can leave the bikeshed safely! We made a survey to find out more about the reasons why students are stressed, and raised awareness in the faculty. We organised the October faculty drinks…And another is coming soon! The door in the GG80-82 bikeshed is broken, and does not open properly. 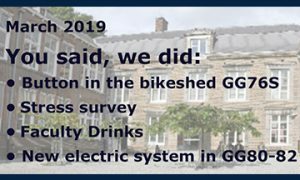 The door in the GG80-82 bikeshed will get a new electric system installed, so the door will soon open properly.